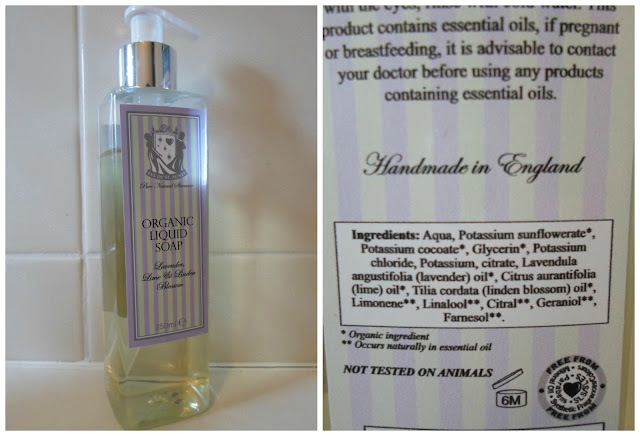 I mentioned in my “what’s in my shower?” video that Eve of St Agnes kindly sent me their Lavender, Lime & Linden Blossom Organic Liquid Soap. This company came to my attention via the Free From Skincare Awards. The Nourishing Cleansing Cream has been shortlisted and the Refining Bamboo Exfoliating Polish was commended. I hate having to disclaimer everything but just in case anyone raises eyebrows, these products were entered in categories which I did not get to judge and I received the soap a couple of weeks ago, long after judging took place. Eve of St Agnes is a British company founded by Emma Heywood. She formulated her skincare line because of skin irritations. Products are free from SLS/SLES, parabens, mineral oil, PEGs and artificial colours and perfume. This soap is made with organic sunflower and coconut oils. The fragrance is an interesting blend, a clean and fresh lime scent with a touch of floral. It lathers up nicely and I have not experience any irritations. That being said it is always important to patch as some people have sensitivity to essential oils. The packaging is simple but elegant and I think the pump dispenses a good amount of soap. Overall, I feel this is a lovely product and I am happy to recommend to my readers. I reckon the skincare range will appeal to many of you so go have a browse Eve of St Agnes website and let me know what you think of it. Disclaimer - PR sample, 100% my own opinion, links are not affiliated.